HARD ACCESS AND BAD WEATHER? ﻿Welcome to Absolute Wraps Limited, home of New Zealand's highest quality scaffold & shrink wrap solutions with outstanding customer service. Absolute Wraps is unquestionably the largest and no.1 shrink wrap specialist in Wellington and neighbouring Regions. It also operates in Canterbury and is swiftly positioning itself in the frontline. Absolute Wraps offers a wide range of Scaffold and Shrink Wrap applications and services. Our professional and highly trained team of scaffolders / shrink wrap installers design and wrap scaffold enclosures to keep UV rays, rain, snow and wind away. We use Layher Scaffolding systems and premium import grade 100% virgin resin shrink wrap films that contain maximum UV inhibitors and are extremely consistent in thickness. The films are 100% recyclable, therefore; helping reduce the consumption of fresh raw materials, the amount of waste sent to landfills, conserving natural resources and reducing air and water pollution. 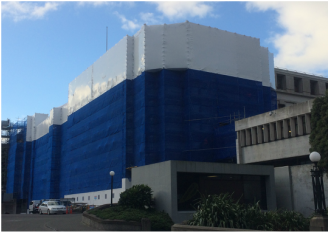 Absolute Wraps is committed in helping you stay on top of your schedule by guaranteeing the most robust scaffolding and/or wrapping to ensure your whole construction project is ready and weather protected throughout the ever changing and very challenging Wellington weather. We are the only shrink wrap company in the whole NZ that offers guaranteed workmanship that can withstand wind gusts of up to 120kph. Beyond scaffolding and shrink wrapping, we can also service your TEMPORARY FENCING and STAFFING requirements!! !